Greetings to everyone from Corrales, New Mexico, where the temperature dipped to 16˚ this morning and I was actually happy not to be camping in the mountains. It’s a far cry from June 20 when the thermometer hit 108˚, but these temperature variations are part of our life here in the high desert. The Land of Enchantment. We hear so much about how today’s young people are disconnected from the Natural World, but we rarely hear about “the Connect.” Without connection there is no desire or impetus for the youth to conserve or care for Nature. For more than 30 years The Tracking Project has worked with Native elders from around the world to create a unique set of programs that connect our students directly to Nature using tracking and other traditional skills. And from this connection comes caring. Caring on the part of our human family is essential to the preservation of all living things here on Earth. Once again, the tracks of the turtle have led us to distant lands and new adventures as we shared our Arts of Life® programs of natural and cultural awareness with interested people and communities around the world — from the western slopes of Oku Pin (Turtle Mountain / the Sandias) near Albuquerque to the lands of the Juruna and the Kayapo in the Xingu Indigenous Preserve of Mato Grosso, from the upcountry forests of Haiku, Maui to the rich, high desert lands of our own northern New Mexico. Our programs are a celebration of diversity within our human family, bringing people together through a better understanding of our shared human needs and the necessity to preserve and care for the Natural World that sustains us all. The Thanksgiving Address series continues to move with a life of its own, spreading a message of respect and an “attitude of gratitude” for all living things. These traditional Native American words of giving thanks come from the people of the Six Nations — the Mohawk, Oneida, Onondaga, Cayuga, Seneca and Tuscarora — also known as the Iroquois or Haudenosaunee, who live in upstate New York, Wisconsin and Canada. We currently have ten different language editions: English, German, Swedish, Japanese, Portuguese, Spanish, Bisayan, French, Hawaiian, and Italian. And we have been working with Sandra Bigtree and others at Onondaga Nation who desired a version of the Thanksgiving words in Hebrew when they hosted the Israeli National Lacrosse team last September. In 2018 we hope to produce a new edition for our series in Hebrew. Did you know that a passage from the Thanksgiving Address appears in the Visa section of every United States passport? 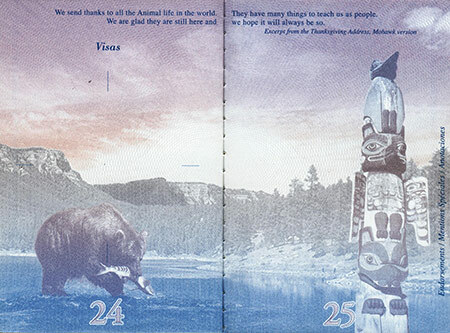 The passport agency made the request of the late Mohawk leader Jade Swamp to excerpt a passage from the book and since 2007 these words thanking The Animals have appeared in well over 100 million passports! 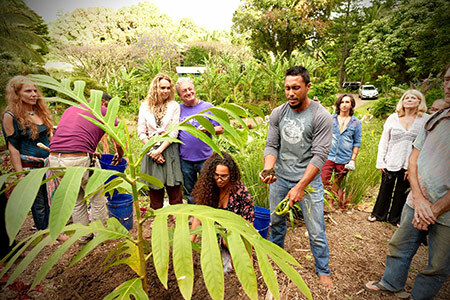 On April 14 Lisa Bennett Matkin and John Stokes joined the staff of HAPI, local Native Hawaiians and members of the Maui community to plant a Tree of Peace. 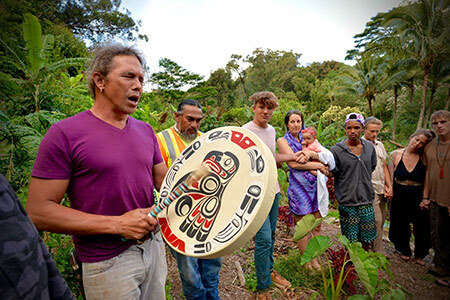 We consulted with kupuna Sam Ka‘ai, the konohiki of the ahupua‘a, who suggested planting an ulu (breadfruit tree), representing “food for the people.” Alika Atay, local farmer/activist / politician performed the opening blessing and Jeffrey Bronfman spoke, giving the background of our work on Maui. 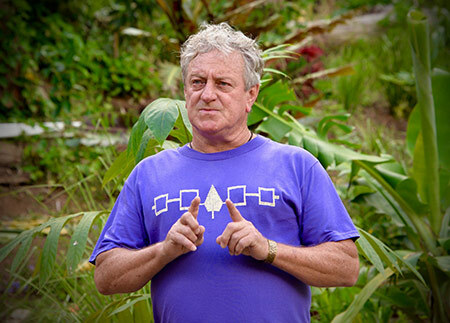 Following the format of Jake’s ceremony, John related a version of the Journey of the Peacemaker and the formation of the Iroquois Confederacy over 1,000 years ago. 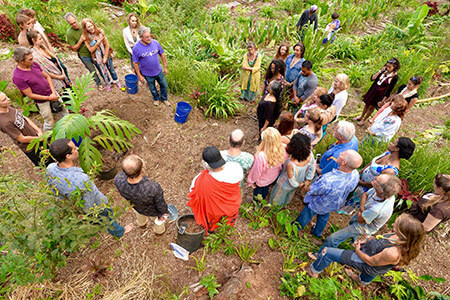 As the tree was put into the ground, Aunty Maile offered her words of blessing and everyone in attendance placed a handful of dirt in the hole. 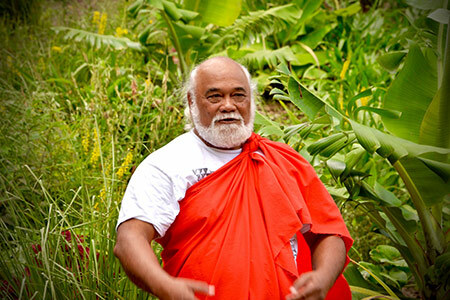 Our friend, Ho‘okipa offered a song in Hawaiian and Darren Williams played ukulele and sang in Hebrew. To close the ceremony, Jason Harris, a Cree Native of Canada who grew up in Rosebud, SD shared his words and a Lakota song on Sam Ka‘ai’s drum. It was a beautiful ceremony and we send our Mahalo to everyone who helped out and attended. May our ulu tree grow strong and tall. Our deepest thanks to the Aurora Foundation for funding assistance to make this ceremony possible. In early October Jade and John Stokes traveled to Cuiabá and Brasília to visit friends and members of our international community mentor network. Once again we were able to visit the Yudja people in Aldeia Aribaru and continue the dialogue we began in 2016 with the community regarding strategies for cultural revival and survival. To arrive in the village required several days of travel for us — four commercial airline flights, a bush plane into the reserve, then a drive by car to the boat which carried us to the aldeia near Rio Xingu. Our visit was coordinated by Duarte Antonio Guerra who has worked as a doctor with the community for many years. Through Duarte’s work with the tribe, the Elders had come to learn of The Tracking Project and they had formally invited us to share our curriculum with them. They, in turn, wished to share their culture with us. We were joined by long-time friend Isabela Crema from UNIPAZ (University of Peace) in Brasília who assisted with translation and several other members of our mentor network, including João Gilberto Peixoto Milanez, Lucas Guerra, João Gabriel Guerra, and Gabriel Bispo. Over 5 days, we deepened our friendship with the tribe through discussions, dream circles, dancing, martial arts training, tracking, gift-giving and music. Each day we offered the Thanksgiving Address and other pieces of our curriculum, while the Yudja would in turn share their dances, their skills at archery and their knowledge of the forest. At one point, Tarepa, the cacique of the village spoke to me: “Tell the world that we are still practicing our culture and that we are still taking care of the rainforest.” I promised that I would do so. Blessings to the Yudja for staying strong and for reaching out to us as friends. 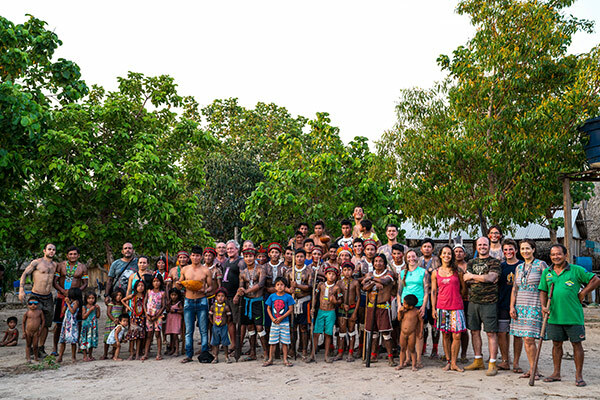 And blessings to Mayalu Waurá Txucarramãe and other members of the Kayapo people who we met with briefly as we passed by their settlement. 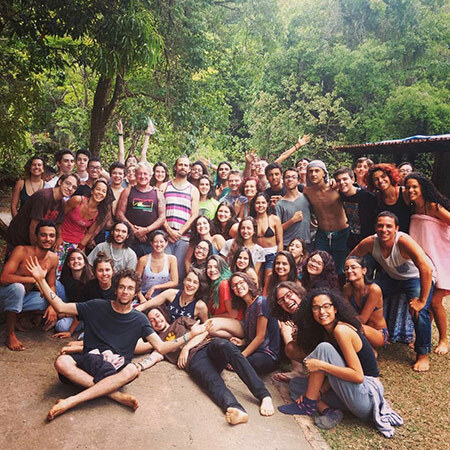 At the end of our visit to Brazil, we attended the Youth Formation at the University of Peace (UNIPAZ) for the fifth time and shared our teachings with almost 50 young people and another 15 or so interns, monitors and leaders. Over three days we spoke of our time with the Yudja, the Thanksgiving Address, Secrets of Natural Movement, dream circles, breathing, silent movement and health tips, Jade’s presentation of the hula, the Journey of the Great Peacemaker. . .
And all the while, as we taught the importance of shelter, water, fire and food, we were praying for rain as wildfires burned around us and the smoke caused us to move all the students from the building where we were teaching. Thanks to Isabela Crema, Luara Presotti, Mariana Azevedo Ribeiro, Edison Luis Guedes Neves and all the mentors of The Tracking Project in Brasília who helped make this visit possible. And to all the youth and parents of the UNIPAZ community, thank you. We send our Greetings and Thanks to everyone who has pledged themselves to our work — to our contributors, our supporters and the foundations who believe in us. Now more than ever is the time when we need the earth, the animals and the sanity that Nature holds for us. In every aspect of Nature we can find a reflection of the holy world through which we can remember who we are as people and why we are here on this earth. With these thoughts in mind, we will continue to evolve as an organization — working for the youth, the Natural World, the preservation of wildlife and the growth of understanding among all people. © 2017 The Tracking Project, Inc. All rights reserved.